Once upon a time “normal” people crafted pottery and sculpted figurines and cave paintings to show something between the “here” of experience and the “there” of thought and form and imagination. The art was perhaps functional. To carry water, to hold grain, to store precious commodities. Or to bring upon the good fortune of goddesses of fertility. Or to tell stories that would last. Then the Christian church arrived… and the Bible… and life seemed to be about depicting the stories and saints in an almost superstitious way to bring us closer to heaven. Fear was a driving factor. The Renaissance opened things up. Suddenly man in his own authentic vision of possibilities and wholeness started to emerge, and art developed alongside this great experimentation in which it was not the distant heavens that could drive us forward in a proscribed pattern — but our own essence that could emerge in creative and powerful ways. I started to think recently of pointillism — that interesting method in which sketching out an idea and then filling it in was not the goal, rather than noticing the dots that connect in a certain way to reveal a pattern. A shape emerges. But… it was still a shape that seemed to emerge after the artist conceived it in the mind first, then made it happen. And… I think the analogy that I am starting to consider is that… our lives as artists might be more akin to Impressionistic. The open canvas. White and truly No Thing. The blank page, as it were. Where anything happens. No sketching. No pencil margins to fill in. No specific pattern in the mind’s eye to execute. Merely…. small, thin brush strokes — a moment here, a moment there. And… truly a moment. Depicting light in this moment. Then noticing how it has changed in the next moment. And dancing along with it. Time and space are captured, in its way… but…. as movement. Not a precise dot that makes something emerge. Not a single swooping brush stroke that executes a plan of action. But an effect… of time and space and light and no thingness that shows us our own ability to perceive and experience a moment and many moments in the unusual dimensions at our disposal. 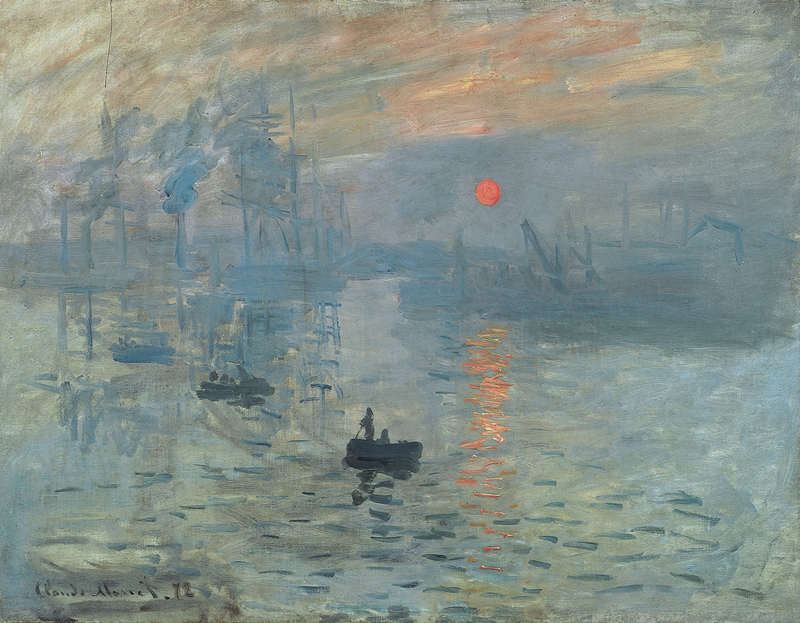 It was the criticism of Parisian Louis Leroy who made fun of what was thus dubbed Impressionism when he poked at Claude Monet’s Impression, Sunrise (pictured here). He declared that Monet’s painting of a seascape was barely a sketch — not even as finished a piece of work as fresh wallpaper. Of course… Leroy seems to have captured the idea, even if he did not appreciate value in it. The work of art that we create, moment by moment by moment, is not supposed to reach a state of completion. We are capturing the splashes of light that infinitely surround us, as best we can. It requires abstract thought. There is that which has no words to define it, so how can you explain it those who only compute with words? You CAN trust what you KNOW deeply and profoundly, Beloveds, because YOU ARE THAT! WE ARE CO -CREATORS! WE ARE DIVINE!